Sometimes the best adventures don’t take place on earth and sometimes the best romances aren’t between humans. 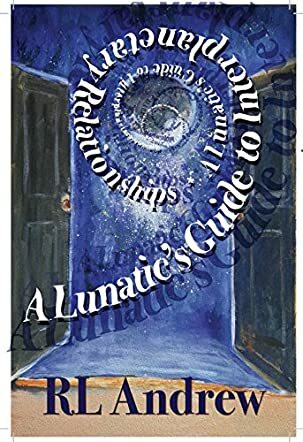 In A Lunatic’s Guide to Interplanetary Relationships by R.L. Andrew, Shayne James, a vulgar and somewhat short-tempered demi-goddess, falls in love with another demi-god named Annu. But before all that, Shayne is constantly smoking joints, cursing about something, and trying to escape her complicated life. Meanwhile Annu is dealing with his own set of personal problems, mainly induced stress from his mother’s constant ambiguity. Fortunately for both of them, a wormhole forms in Shayne’s kitchen and the adventure truly begins. I’m not sure where to start because there are so many great things about A Lunatic’s Guide to Interplanetary Relationships. I suppose I’ll begin with how unique it is. Despite it being a science fiction and fantasy novel, R.L. Andrew intricately makes those two themes quite subtle, allowing for romance and humor to take the lead, and because of this the dialogue and writing are easier to swallow. The story flows smoothly without a hitch and kept me laughing. Though, don’t let that allow you to think there isn’t a fair amount of action and adventure because it has its fair share and it all takes place 1,300 light years away from earth on a planet called Orion ... where Annu and Shayne must get the Annunaki power before a god called Shamesh can. I was engrossed from start to finish, and especially in the very last scene when my jaw dropped. I cannot ‘flarking’ wait for the next installment!